Another Spanish dish. No fuss way to stew chicken that has all the flavours of spain. All you need to accompany is a 6-pack of San Miguel and some greenery and you’re set. Sprinkle the chicken in salt & pepper and set aside. Mash the garlic with the parsley and a little salt, stir in the wine and the paprika and set aside. Heat a large pan with 3 tablespoons of the olive oil over a moderate heat and fry the chicken to brown on all sides. Add the onion, carrots and capsicum and continue to cook for 4-5 minutes until softened and lightly browned. Stir in the mashed mixture, cover and reduce the heat to low. Cook slowly for 35 minutes. Meanwhile, in a large frying pan, add the remaining 3 tablespoons of oil and heat over a moderate temperature. Fry the potatoes in one layer with a little salt for 10 minutes, turning occasionally to avoid sticking, until they are tender. 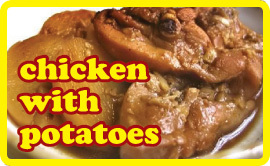 Drain away the oil and add the potatoes to the chicken, stirring carefully. Cook for 5 further minutes before serving. We ate with a green salad and some bread.